This week COLOURS mix is by one of the biggest Spanish artists of the moment. What are the ingredients of Sergio Fernandez? Where should I take my dose? Non stop dancing until you drop dead! How will I know if he works on me? 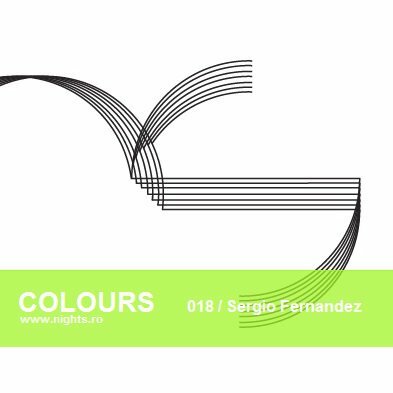 Sergio Fernandez is one of the most relevant electronic artists of our times. During the last years he has received several nominations, granted by Spanish Deejay and DJ1 Mags, for best Spanish DJ, Best Progressive & Tech House DJ, best Tech House producer, best tech house track - with “El Son te Llama” on Spinnin Records, best remix - with “Unforgettable Summer 2010 Vision Main Mix” on Insert Coin Records, and best breakthrough label - with his own imprint Insert Coin Records. Sergio Fernandez has already released two fantastic albums “Mob Rule” 2008 and “Angel or Demon” 2010, on one of the most prestigious labels, Uk imprint Baroque Records. Both were critically acclaimed and recieved commercial success. By the end of 2009, Chris Lake found Sergio Fernandez..s talent asking him to remix his new single together with Deadmau5 “I Said” for Mau5trap Records. He has also released original works and remixes on the best international labels, such as Toolroom (Leaders of the New School), Spinnin.. and of course, his own label Insert Coin Records. In 2010 he set upon a new adventure, being the official DJ of the ‘Fetish Loop’ audio visual experience tour. His style varies from exquisite minimal to more intense progressive beats. One of the most important facets of Sergio..s performance is the balance he strikes between his pure technique as a DJ and his ability to transmit great energy into the crowd. 10. Robbie Taylor and Robbie MacRowland – Warehouse (Belocca Remix) Wazzup?